Ever wonder where Jugglers get their inspiration from, and how they keep up with the latest goings on in the world of Juggling? Well, here are my 5 favourite Juggling Resources for you to consider adding to your Favourites/Bookmarks! Rec.Juggling Newsgroup this can be accessed through the JugglingDB website or as an RSS Feed. Whenever I have a problem or a query related to juggling, I have been able to get friendly advice and a solution quickly. Be warned, you could spend your entire day in this newsgroup as people are posting all the time, but it’s certainly worth becoming a contributor and joining in the discussions! #37 – A History of Juggling on the InternetYou can download via ITunes (just follow the instructions on Luke’s website). The Magic Cafe This is possibly the world’s largest forum dedicated to all things Magic! If you scroll down to just below halfway on the main forum directory, you can find a section called “Carnival of Fun” and in this, there are thousands of topics relating to Clowning, Juggling, Circus Skills, Side-shows, Ventriloquism, Balloon modelling etc. The Magic Cafe is a fantastic friendly place to hang out. They have plenty of moderators to look after you, but please do read their etiquette (rules) before you do any posting! Christian Jugglers Association (CJA) Christian Jugglers Association (CJA) – you can see my photograph on the homepage (juggling the blue balls). If you are interested in combining your Juggling Skills with Christianity to become a Gospel Juggler, then sign up for their quarterly newsletter (full of ideas, routines, testimonies etc) and become a welcome part of this encouraging community of people. 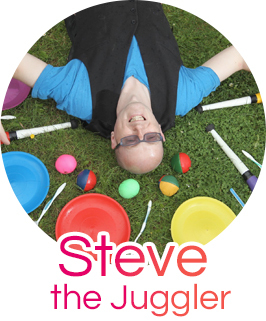 Nearly all members live in the USA, but if there are any more UK Gospel Jugglers out there, please drop me an e-mail to say hi! Everyone of course has their own favourite juggling websites, and I could have mentioned many more, but I will save them for another article. Enjoy! This is a Summer of firsts for me! I performed at my First Hen Party (no I didn’t strip!) I ran a workshop and the women loved it! Last weekend, I performed at my first 90th Birthday Party. Thankfully I didn’t have to give the woman the Birthday Bumps or light all the candles carefully on the cake! I was the warm-up act for Celebrity Chef Delia Smith giving her Testimony at the Northern Catholic Conference in Liverpool, then I got to meet the legend that is Jimmy Cricket afterwards! I was hired as a professional Plate Spinner to help launch the new China Crockery department at a large department store in London. I got to run Workshops to keep all the kids at my Sister-in-Laws wedding. A good way to meet the latest branch of my Wife’s ever expanding family tree! People are just beginning to think about planning Halloween, Fireworks Night, CHRISTmas Light Switch On’s and CHRISTmas Parties. Please keep me in mind and pass my details to others.Much appreciated! More products being phased out to make room for new stock. Many items reduced to well below cost price. Visit my Bargain Basement page to find out more and snap up a bargain while stocks last. New look website is now over 1yr old. Sadly over the past few months, my website has suffered various problems such as crashing due to a change in server (now rectified), ever since then I haven’t had images appearing in the shopping cart or throughout the Juggler for Hire and Tricks sections of my website. The shopping cart still works fine so you can go ahead and order despite this annoyance! These problems are currently being looked into by a development team as I have wasted a lot of my own time trying unsuccessfully to solve the problems over the past few months so it is time to bring in the experts! I am giving them a list of some new exciting features to add also, so it’s not all bad news! If you do notice anything wrong with my website, please be kind enough to let me know as Jugglingworld is a one-man show, not a large business with many staff – the buck stops here and I can’t be aware of every problem or annoyance that people stumble across unless they kindly tell me! Thank you for your continued support and co-operation.